Jeannette Lindenbach, shown at the far right, is a Professor of Nursing and Health Sciences with the Laurentian University & College Boreal Nursing program. 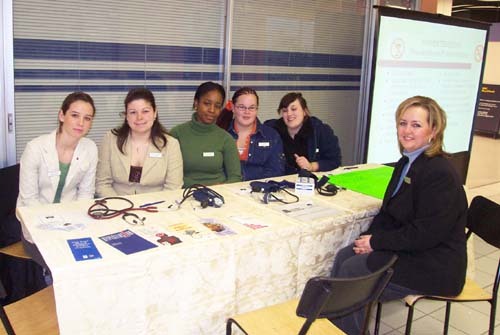 She and five of her students spent the morning of February 6, 2006 at the Hanmer Valley Shopping Centre providing visitors to the mall with blood pressure testing and health advice. The students, from the left, include: Alexie Houle, Amanda Beaulieu, Carole Tshibasu, Joelle Lachance and Melanie Wissell. All are in the first year of a four-year Bachelor of Science in Nursing program. In the above photo, Alexie and Ms. Lindenbach prepare the slide projector for the powerpoint presentation that was used during the morning. Carole Tshibasy is the only student who does not hail from the Sudbury area. She comes from Montreal and is looking forward to a career in Nursing in that area after graduation. Amanda, Joelle and Melanie are all from Valley East, while Alexie is from Chelmsford. "I always wanted to work in the medical field," stated Alexie when asked why she choose nursing as a career. "Nursing seemed like a good field to start out in. There are so many different careers within nursing itself that it leaves a lot of doors open if I decide to focus on one particular area of medicine." For Amanda, nursing offers a challenging career while at the same time giving her the opportunity to enjoy a satisfying family life as well. "Nursing seems to allow you to have a nice balance between a career and a family." All of the girls, with the exception of Carole, are hoping to remain in Sudbury to practice once they graduate. While they were at the Hanmer Valley Shopping Centre, the girls, under the supervision of Ms. Lindenbach, tested volunteers for blood pressure and pulse rate. Each person was provided with a log book. For more information about the program, you can contact Diane Mageau at College Boreal 560-6673, Ext. 4540 and Anita Pelletier, Laurentian University 675-1151.